Our greatest wish is to find a home for every animal at the shelter. Until we can accomplish that, we have a need for several items that can help us provide for them. When shopping on Amazon, remember to always use smile.amazon.com and select us as your charity to give back even more! Spring Cleaning? Don’t forget about us! A frayed towel or a faded blanket is just the ticket. Our kitties and puppies love to cuddle and snuggle up in them. HHHS also accepts donation of aluminum cans. 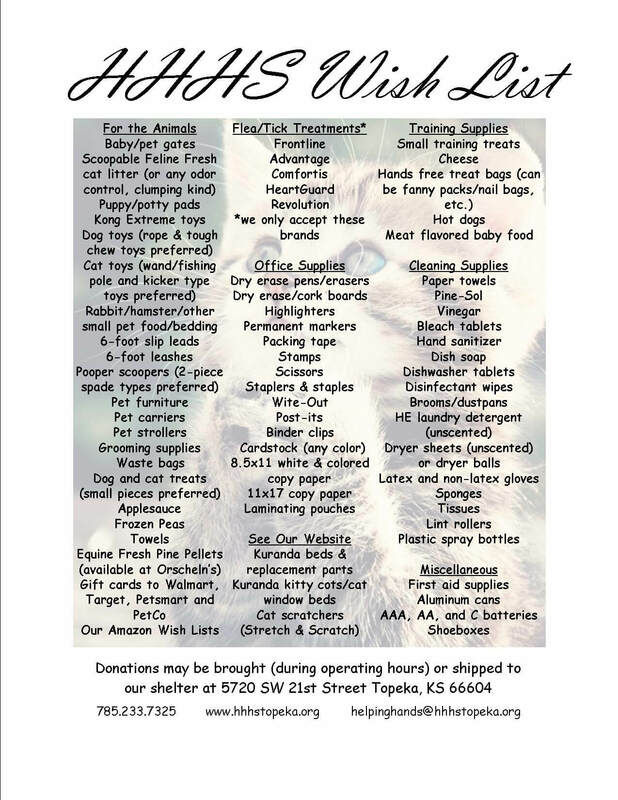 Items can be dropped off at the shelter, 5720 SW 21st Street, during regular business hours. Let us know if you need assistance removing items from your vehicle. Thank you for your support!